But I love their pasta! 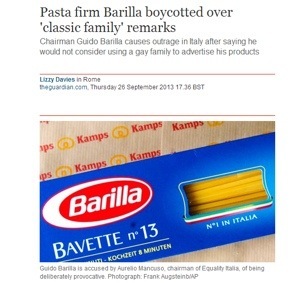 Guido Barilla, chairman of the Italian pasta brand Barilla, has stated that they will never make an advert with a homosexual family, to conserve the “sacredness of the family”. Gay groups have called for a boycott. This entry was posted in Discrimination, People, Politics, Social structures, Stereotypes and tagged Barilla, boycott, Family, Food, gay, gay rights, Gender, gender equality, homosexual, Italy, Pasta by The Gender Observer. Bookmark the permalink. Seems like he later has apologized for his initial comment, and said he only wanted to accentuate women`s important role in the family. So now I can perhaps eat their pasta again? Please??? I’m out of league here. Too much brain power on dipalsy!